The symbolic construct that surrounds a space revolves around the people who inhabit it or come to inhabit it for short or long moments, however it is difficult to locate them immediately. Fortunately to bring these memories to the table today exist the platform Instagram of evocations. Images and narrations through hashtags that build micro-stories by these words, which can to describe or describe a small part of this complex been space such as Ebertplatz that has been built and remodeled several times throughout its life. Currently there is this monument that we know now and the memories that revolve around the park where a way to create small linear narratives and not lines is through a piece where small amounts of concepts and images are grouped that interact with the audience as a form of memory and memories that become present when digging on the internet and bring them from the sediments of the network. After seeing the memories that build Eberplatz one wonders if it is necessary to remodel it to highlight the progress and modernity in which a city with history is invaded from its public spaces. 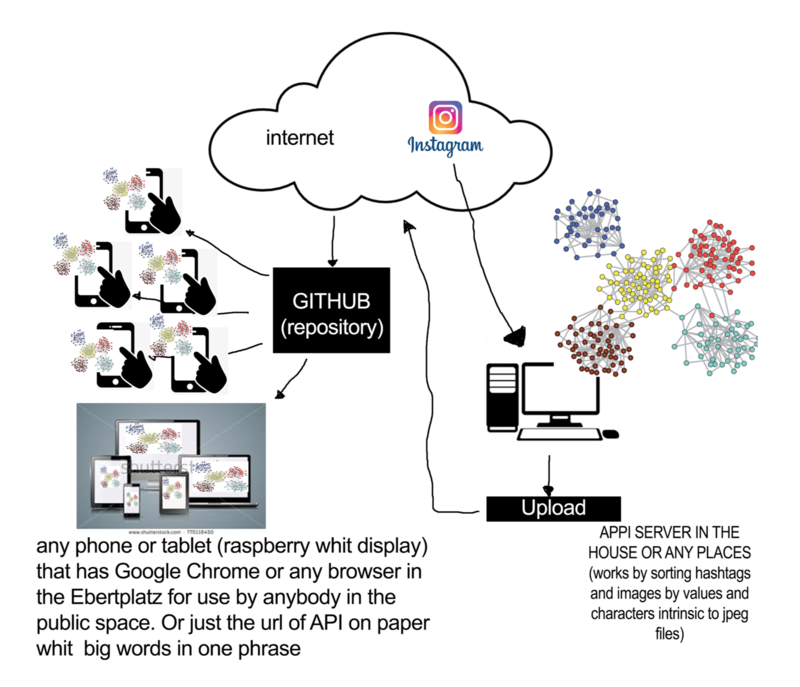 That is why this piece is built around the memory and the construction of the collective imaginary of a public space, a piece that ends up being published on the Internet and its cloud so that everyone can interact publicly and privately through their cell phones or with the piece exposed in the public space. By Oscar Formacio in collaboration with Emmanuel Anguiano.